Mark 37C Torpedo System Technical Description, NVR 73-50, 1973, describes the update of the Mk 37 torpedo to the C version. The MK 37 torpedo was developed in the early 1950's as a dual purpose antiship or antisubmarine torpedo. Increases in surface ship and submarine threat performance have greatly reduced the anticipated effectiveness of the basic MK 37. In addition to higher speeds and longer sonar detection capabilities of present-day combatants, submarine streamlining characteristics have greatly reduced active sonar detection. Quieting and low-silhouette hull shapes increase the detection and attack requirements of such torpedoes as the MK 37. Because the MK 37 is an established dual purpose torpedo system which will be carried in inventory by the United States and its allies for some years to come, both Northrop and the U.S. Navy have taken steps to improve its performance. In addition, it is recognized that the MK 37 warhead needed increased effectiveness against certain types of surface ships. 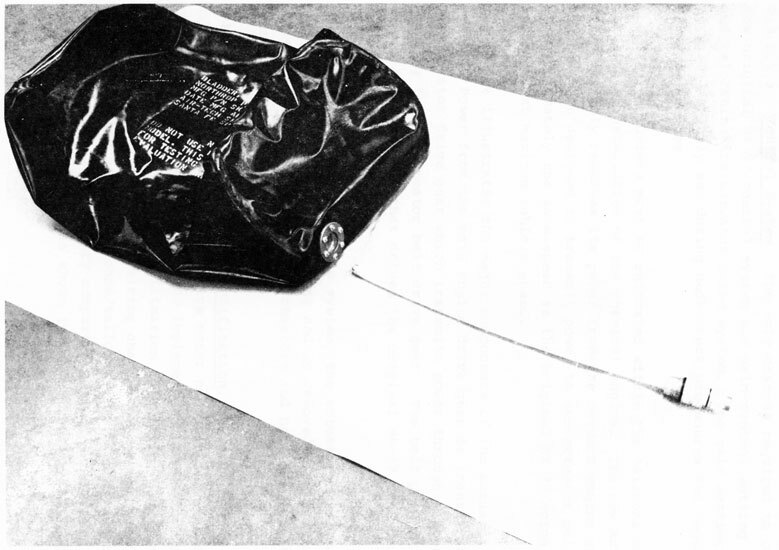 In 1968, Northrop demonstrated the feasibility of a Northrop conceived speed-up kit. The speed-up kit consisted of replacing the MK 37 electric motor and propulsion battery with a MK 46 engine and an Otto fuel system. The speed-up system not only yielded a speed increase of over 40%, but increased endurance by over 60%. This more than doubled the MK 37 run range. 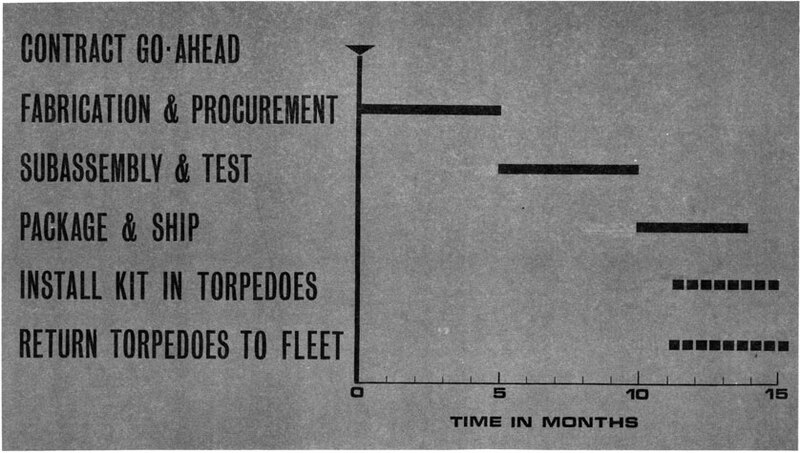 In early 1969, U.S. Navy personnel at the Naval Torpedo Station, Keyport, Washington, demonstrated their own improvement in Active acoustics performance against small silhouette submarines. In addition, false alarm protection improvement was demonstrated in high sea states. A pictorial representation of the acoustic improvement is shown in Figure 1-1. The acoustic sweep area of the MK 37 is shown as the torpedo executes a snake search. The azimuth acoustic sweep area is shown in the top diagram while the depth acoustic sweep area is shown in the bottom diagram. The area enclosed by the outer dashed line indicates the ideal maximum sweep area based on maximum acoustic range. The cross-hatched area shows the capability of the basic MK 37 against a small silhouette target, while the extended shaded area indicates the substantial improvement obtained by incorporating the acoustic changes. The speed/endurance/acoustic improvements were combined by Northrop and the U.S. Navy and systems tested for compatibility from mid-1969 into early 1970. This improved torpedo was designated by Northrop as the MK 37C. To date, 185 in-water and scores of laboratory type tests have contributed to the development and demonstration of the MK 37C. Proven operational parameters of the MK 37C are compared with those of the standard MK 37 in Table 1-1. The problem of increased warhead effectiveness is best solved by increasing the chance of multiple hits to enhance surface ship sinking probabilities. Of major importance is the Northrop antiship improvement program that was initiated in 1972. These improvements, which are presently being tested at sea, will provide intercept course, spread fire capability, and reattack logic, to greatly increase MK 37C multiple hit, thus ship kill capability. Two concepts are under test for incorporation in the MK 37C. 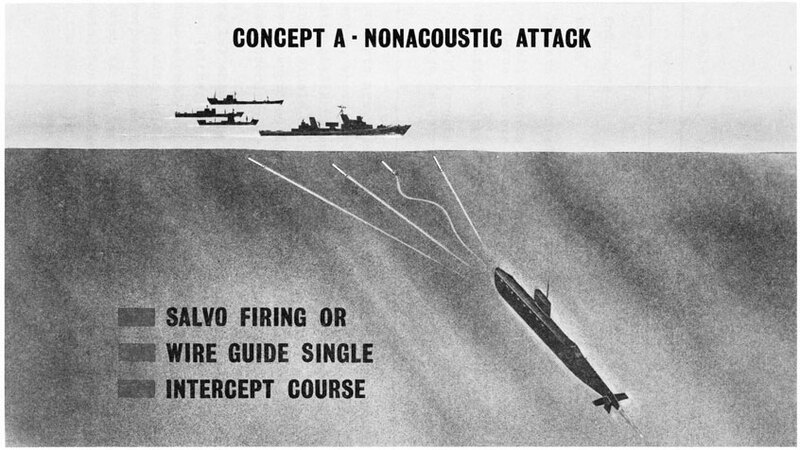 Concept A, shown pictorially in Figure 1-2, provides for a non-acoustic attack by spread firing multiple torpedoes, or by wire guiding a single unit. In the event a multiple wire guiding capability is approved for other wire guided torpedoes, the MK 37C can be used accordingly. Figure 1-3 shows the second concept, Concept B. 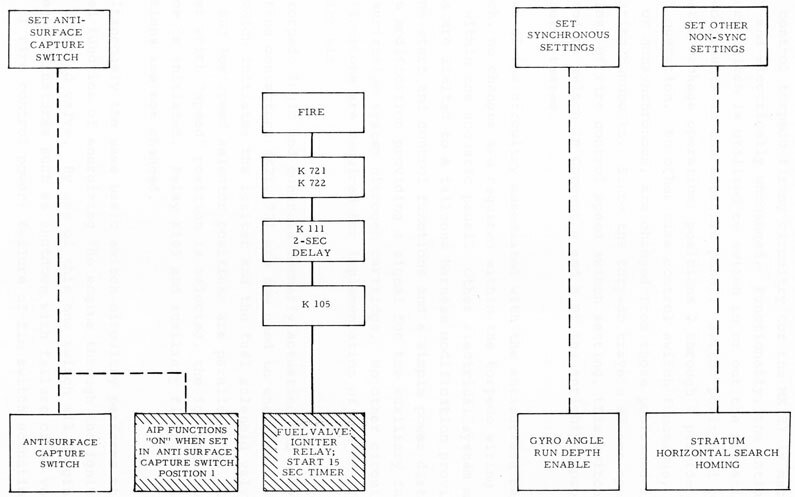 In this configuration (either Concept A or B may be selected by fire control settings already existing for standard MK 37 firings), spread firing or wire guidance may be initiated. However, at Enable, the torpedo begins listening acoustically. The homing system then indicates if the target is missed and initiates reattacks that are nonhoming for a preset time interval. The homing system then converts the MK 37C to a passive homing torpedo. Purely wire guided, nonacoustic torpedoes do not offer these capabilities. 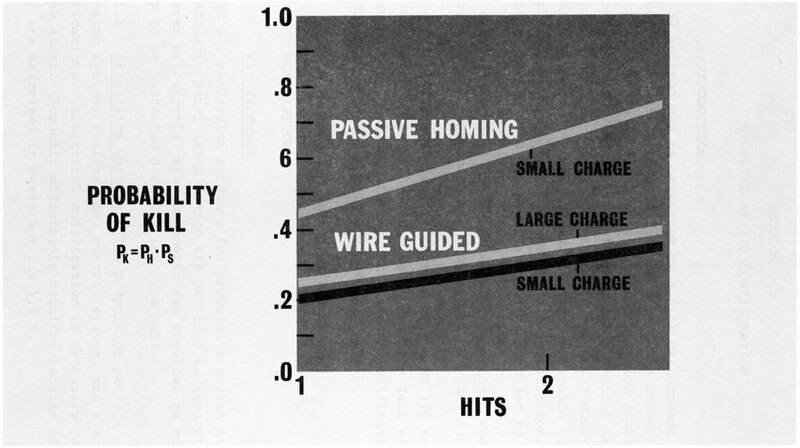 As seen from Figure 1-4, the Probability of Kill is virtually the same for the MK 37 size warhead (small charge) as for a warhead twice its size in the wire guided mode. In the case of passive acoustic homing, the MK 37 size warhead is almost twice as effective as the larger warhead because of its multiple hit capability. 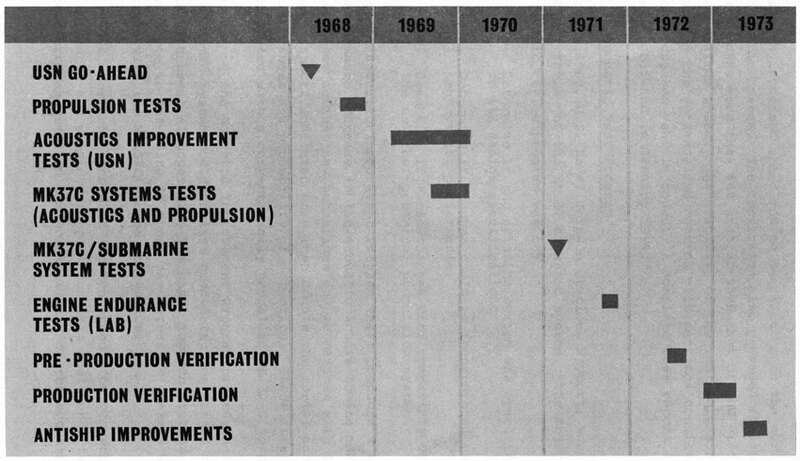 These new antiship improvements will have testing completed by October 1973. At that time, this report will be revised to reflect new antiship improvements. Section 2.0 of this report presents the baseline configuration and technical description of the MK 37C torpedo. A performance description is given in Section 3.0. Section 4.0 presents the conversion implementation approach, and support requirements are listed in Section 5.0. A MK 37 torpedo can be converted to a high performance MK 37C torpedo by the field installation of a hardware conversion kit. The total conversion kit consists of a propulsion package, an acoustic package, ancillary equipment, and technical services. The propulsion package is applicable to all MK 37 MODs; the acoustic package with variations, is also applicable to all MODs. The conversion kit is designed as a field installation, performed by the Customer, with technical assistance provided by Northrop. 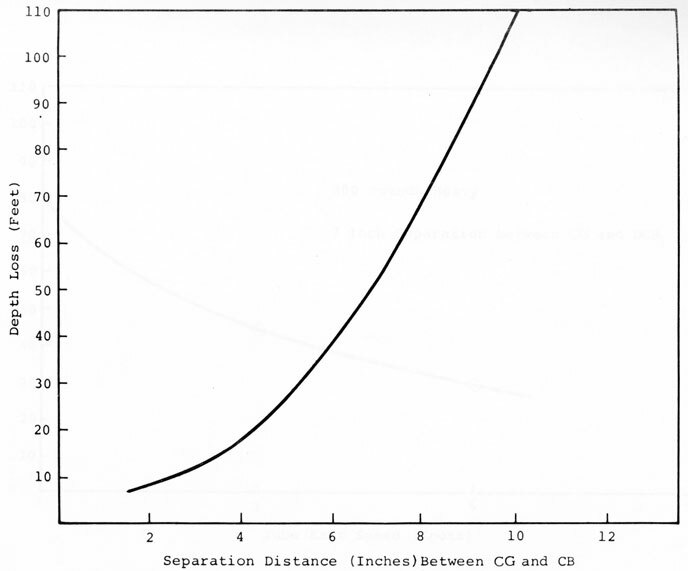 This section describes the baseline configuration. The various portions of the conversion kit are defined and functions given. Figure 2-1 presents an inboard profile of the MK 37C torpedo. The propulsion part of the kit affects only the tail section and former battery section. The acoustic system modification is accomplished entirely within the acoustic panel. The MK 37C conversion hardware for propulsion system installation and acoustic panel installation are provided as separate packages. Wherever practicable, kit components are provided as subassemblies ready to be installed directly into the hull. 2.3.1.1 Propulsion Package. The propulsion package consists of an engine system, fuel system, control system, and electrical modifications. Electrical modification is necessary to facilitate engine start. Acoustic adjustments required because of increased speed are described in paragraph 2.3.1.1.5. 2.3.1.1.1 Engine System. The engine system consists of a standard MK 46-1 thermochemical engine and accessories bulkhead assembly. The engine system is adapted to the MK 37 tailcone hull by a forward accessories bulkhead adapter and aft shaft bearing/seal adapter. All components fasten to existing tapped holes vacated by the removal of the original drive motor assembly. Fuel is supplied from a pressurized fuel tank to a fuel pump that supplies high-pressure fuel to the combustor; combustion occurs in the water-cooled combustion chamber; the hot gas drives the cam-piston engine and exhaust products are vented overboard through a check valve in the inner drive shaft. The MK 46 cam-piston engine is essentially a constant torque output device, with the torque dependent on combustion pressure and back pressure. Fuel pump output pressure (combustion pressure) is controlled by an internal regulator that is referenced to sea pressure to maintain nearly constant shaft output torque as the sea pressure increases with depth. Constant vehicle speed is then maintained at all running depths. The output power is delivered to the propellers by counter-rotating shafts; one driven by the cam and pistons and the other from the reacting housing of the engine which is free to provide torque output. These two shafts drive counterrotating propellers. The propellers were designed for the speed and load conditions of the converted MK 37. The tailcone assembly contains all major components of the vehicle propulsion system except for the fuel tank and battery. The relative engine shaft speed is approximately the same as the standard MK 46-1. 2.3.1.1.2 Fuel System. The fuel section formerly carried the batteries for the MK 37. A major part of the conversion in this section consists of changing it to fuel storage and transfer. The design optimizes available fuel storage volume and provides for pressurized expulsion of fuel initiated by a pressurization cartridge and sustained pressure. The replacement of expended fuel with seawater also approximately maintains the vehicle weight and balance as fuel is consumed. The fuel tank system is depicted in Figure 2-4. Fuel is contained in a rubber impregnated nylon fuel cell assembly installed in the former battery compartment. The fuel cell has a capacity of 26 gallons and is restrained by the hull and bulkheads. Protective stripping is installed over all sharp edges of the hull interior to prevent abrasion of the fuel cell. The fuel cell shown in Figure 2-5 is attached to an aft bulkhead fitting by a threaded attachment, and is easily replaced. An internal perforated fuel pick-up tube assures steady flow of fuel from the fuel cell assembly. Extensive in-water testing has established excellent performance characteristics of the MK 37C fuel cell. Seawater enters the seawater scoop assembly and passes through a pressure regulator prior to entering the fuel tank. The fuel cell is immersed in pressurized seawater (4 to 30 psi) which forces fuel from the bladder into the fuel outlet hose leading to the fuel control valve and the fuel pump. As fuel is consumed, the fuel cell folds to the bottom of the fuel hull and seawater displaces fuel throughout the torpedo run. In the warshot configuration, this displacement varies the vehicle buoyancy from about -240 pounds to about -190 pounds, if all fuel is expended. The exercise configuration remains positively buoyant from about +50 lbs to about +100 lbs, depending upon the amount of fuel expended. 2.3.1.1.3 Control System. The only changes required to convert the original MK 37 control system are gain control setting changes and relocating the actuator drive system. The gain settings are normally manually set during deck-check procedures and require no hardware changes. The MK 37 actuators must be relocated within the tailcone hull to facilitate installation of the chemical engine. The new actuator drive assembly receives its power from the forward engine gear and has been designed to transmit power to the actuator pulleys at approximately the same speed as the original MK 37 actuator operating at maximum vehicle speed. Figure 2-6 illustrates the major components of the actuator drive system. Power from the main engine drive gear is transferred to the actuator drive gear which transmits power through a gear coupling to the actuator belt drive gear. The belt gear drive powers a timing belt that drives the original MK 37 actuator pulleys. Upon disassembly of the engine system, the actuator drive gear disengages from the gear coupling and is removed with the accessories bulkhead assembly. The actuators and belt drive unit remain in the tailcone hull. 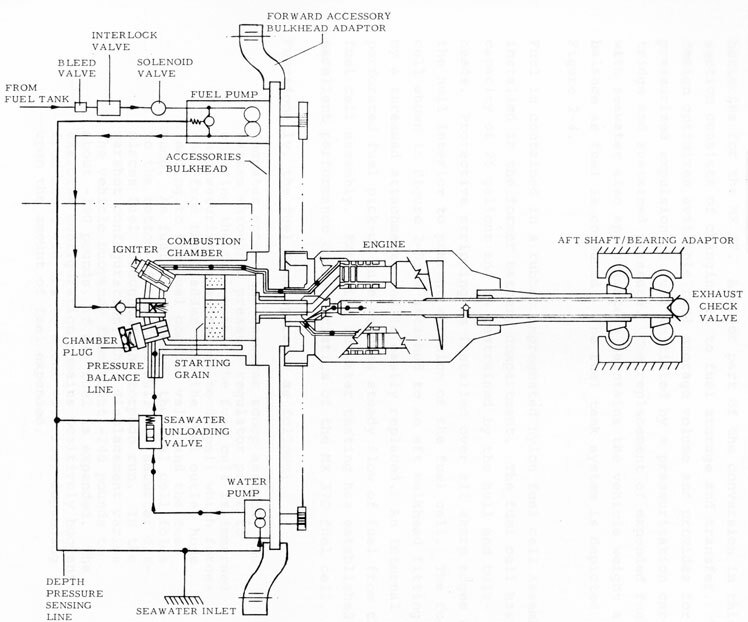 Fire control torpedo firing circuitry for the MK 37 is mechanically and electrically unchanged. Functionally, the antisurface capture switch is utilized to switch in or out the Acoustic Package components in the acoustic panel. Switch position 1 provides Acoustic Package operation; positions 2 through 7 provide normal MK 37 operation. No other fire control switch functions, synchronous or nonsynchronous, are changed from those published in the operating handbooks. Since the torpedo travels at one speed regardless of fire control speed switch setting, this switch will be used to switch in Concept A and B of the antiship improvements now being tested. By use of the circuitry associated with the antisurface capture switch, no changes are required within the torpedo wiring other than within the acoustic panel. Other electrical system modifications are limited to a tailcone harness modification providing engine start and control functions and a simple power distribution cable modification providing a signal for the auxiliary fuel tank pressurization system nitrogen cartridge. 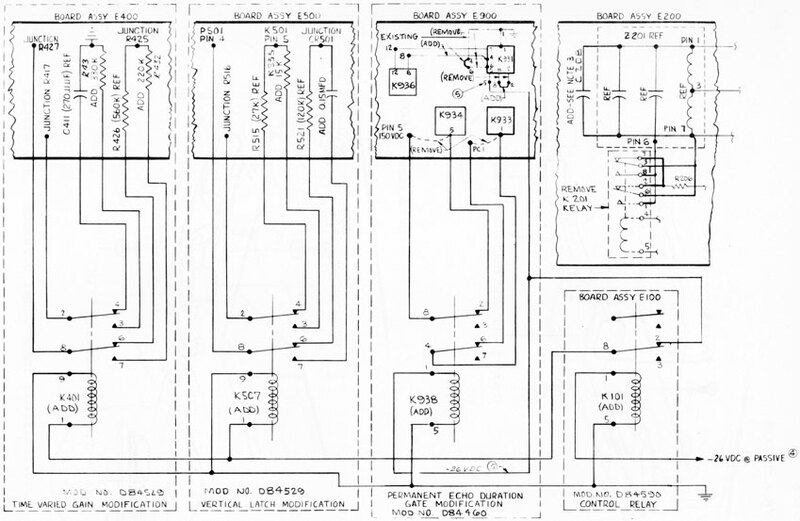 No other circuitry modifications are required for implementation of the MK 37C conversion kit. The torpedo logic and controls formerly actuating the heavy motor starting contactors (K21, 22) are now used to energize a relay, Kl, which initiates the igniter and the fuel solenoid valve. The high and low speed selector positions are paralleled so that no matter which "speed" position is selected, the igniter-fuel sequence is initiated. Relay K105 and auxiliary firing relay K722 functions are not changed. other malfunctions, will prevent engine start-up or perform engine shutdown if a malfunction develops after start-up. 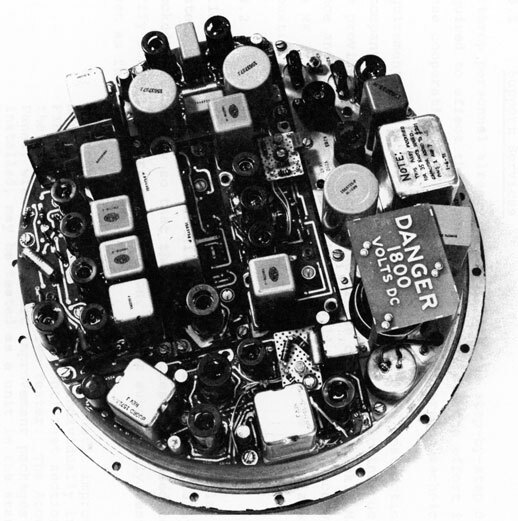 A pole of SW102 formerly actuated Relay K201 in the Acoustic Panel (transmitter) when the "high" speed position was selected, before fire. This relay formerly lowered the transmit frequency at high speed by adding a capacitor to the frequency determining resonant network, within Z201. Since the MK 37C operates only at one speed, the additional capacitor is soldered across Z201 (2.3.1.1.5) to permanently lower the frequency by the correct amount. Two 2-Amp "Slo Blo" fuses are wired into the igniter circuit to prevent shorting of the battery should the igniter bridge wire short to ground at igniter burnout. A diode is provided in parallel with relay Kl to minimize voltage transients during relay switching. Wiring for the TD1, Kl, fuse and capacitor in the igniter box is routed to a box-mounted connector which effects distribution to the existing tailcone harness and to the igniter and fuel solenoid valve connectors. Rearrangement of the exploder and acoustic cabling is accomplished at the fuel section (formerly battery section) aft bulkhead by withdrawing the cabling from the bulkhead end, then routing the cables and connectors through the newly installed conduit from the aft to the forward fuel tank bulkhead (see Figure 2-4). Power distribution to/from the aft bulkhead-mounted battery is effected through wiring harness at the battery. 2.3.1.1.5 Acoustic System Modification. Only two changes are required in the existing MK 37 acoustic system, as a direct result of the propulsion speed-up package. The value of one capacitor must be changed to shift the transmit frequency to a lower value to accommodate increased torpedo speed. This capacitor is located on board E200 of the acoustic panel. This second change, implemented in the E200 and E400 boards, decreases the shallow passive acoustic sensitivity as required by increased torpedo speed. 2.3.1.2 Acoustic Package. Relatively simple hardware changes are required to incorporate the MK 37C acoustic improvements into the present acoustic panel. Six circuit changes are made. Four of these changes relate to the acoustic improvements to obtain increased acquisition range. Another is associated with removing the conversion changes when passive mode is used, and the sixth change provides for acoustic panel vibration isolation. Adjustments required to compensate for increased speed, which are described in paragraph 2.3.1.1.5, are not considered part of the Acoustic Package. The acoustic panel changes to be described below are listed in the end item tree, Figure 2-2, under the heading, "Acoustic Kit." Hardware for all acoustic changes is packaged for easy field installation in the MK 37 system. Changes are summarized schematically in Figure 2-8, which shows their localization on four boards within the acoustic panel. Subassemblies are provided which are readily attached to affected Acoustic Modules 400, 500, 900, and the mother board. The changes may be switched in or out by means of subminiature relays located close to the components. This permits normal MK 37 operation for either test or operation. With this feature, acoustic Functional Item Replacement (FIR) testing can be performed in the usual manner. An illustration of the type of circuit package to be supplied is shown in Figure 2-9. Components are mounted on circuit boards and attached to available mounting bracketry. Boards are attached to the appropriate acoustic subpanel to permit FIR checkout. A brief description is given below for the various changes. This description is based on the conversion of a MK 37 torpedo with a MOD 2 or MOD 3 acoustic system. Changes for MOD 0 and MOD 1 acoustic systems are given in Section 2.3.1.2.7.
homing device must be increased. Tests conducted to date have indicated that the basic MK 37 Acoustic Panel has the sensitivity capability but some of the automatic gain control circuits, originally thought necessary, have prevented it from achieving its potential. The Time Varied Gain (TVG) modification overcomes this limitation. Detection threshold for a particular sonar is a compromise between the acceptable detection probability and the acceptable false-alarm probability for the system under the conditions in which it is to be used. Increases in target speed increase the probability that the torpedo will end up in an overtaking situation. This condition imposes a small target stern aspect and results in low signal strength return for an active sonar. A threshold reduction (sensitivity increase) is required to attain an acceptable detection probability against these low return targets. Since it follows that false alarms may result, additional changes are introduced to compensate for this condition. The time variable gain change discussed in this section relates to panel sensitivity increase while the next three sections pertain to false alarm protection. To increase acoustic panel sensitivity, the TVG discharge resistor (R426) is reduced from 560K to 220K ohms. This change provides additional sensitivity at shorter ranges and permits detection of smaller targets. directional information. A typical case is that of surface reflected signals which will arrive after the direct path signals. Since these signals appear to originate from above, they will produce an "up" steer command regardless of the actual depression angle of the target. If correct target steering has been achieved by the direct path echo, this "up" command will result in target loss and, what is worse, may direct the torpedo toward the surface. 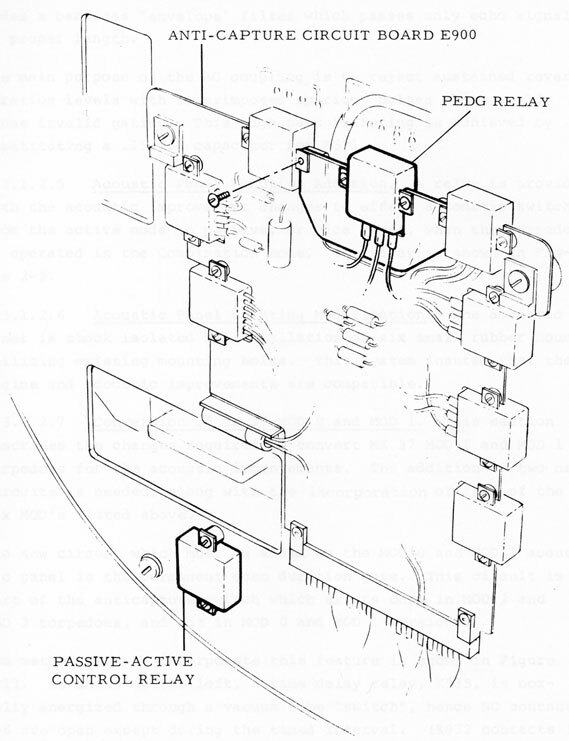 Lock-in contacts are provided on the steering relay (K501). Resistor R515 serves to partially lock this relay into closed position once a steering order is received. This lock-in function prevents reverse steering due to second echo arrival from the surface. 2.3.1.2.3 Permanent Echo Duration Gate Modification (PEDG). 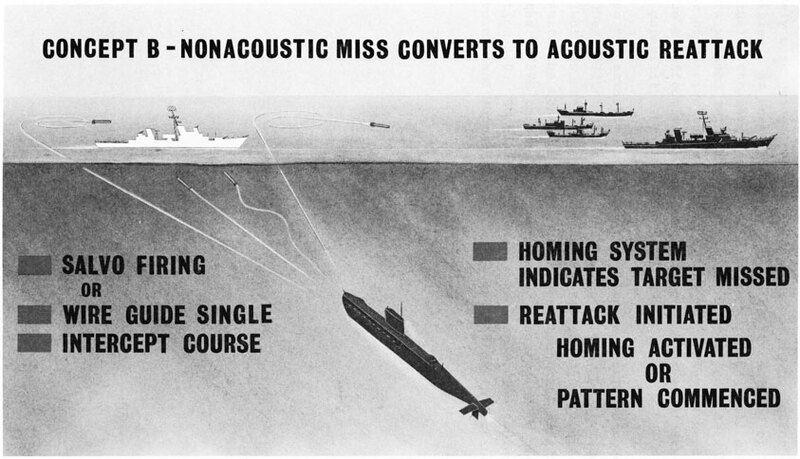 The normal acoustic signals received from a submarine target are known to differ in character from those received from nonsubmarine targets, such as the surface or bottom. The PEDG modification, along with the Alternating Current Coupling (ACC) modification, described in paragraph 2.3.1.2.4, is provided to optimize the recognition of unique submarine target signal characteristics. Reverberation may produce a short spike signal in an active homing system. Valid target echoes will normally be at least as long as the transmitted pulse. Elongation will vary with the target aspect and target length such that a stern aspect target will tend to pro-vide a longer return signal. These facts have been acknowledged and implemented by requiring the Echo Duration Gate of the anti-capture system to be switched into the active mode whenever the acoustic improvement mode is selected. The relay for this function is the upper one shown in Figure 2-10.
pass" filter) complements the PEDG ("low pass" filter). It provides a bandpass "envelope" filter which passes only echo signals of proper length. The main purpose of the AC coupling is to reject sustained reverberation levels with superimposed spurious pulses which could cause invalid gating. This high pass filtering is achieved by substituting a .15 mfd capacitor for R521. 2.3.1.2.5 Acoustic Panel Function Addition. A relay is provided with the acoustic improvement changes to effect automatic switching from the active mode to passive, or vice versa, when the torpedo is operated in the Combination mode. The relay is shown in Figure 2-9. 2.3.1.2.6 Acoustic Panel Mounting Modification. The acoustic panel is shock isolated by installation of six small rubber mounts utilizing existing mounting holes. This system insures that the engine and acoustic improvements are compatible. 2.3.1.2.7 Conversion of MK 37 MOD 0 and MOD 1. This section describes the changes required to convert MK 37 MOD 0 and MOD 1 torpedoes for the acoustic improvements. The addition of two new circuits is needed, along with the incorporation of five of the six MOD's listed above. One new circuit which must be added to the MOD 0 and MOD 1 acoustic panel is the permanent echo duration gate. This circuit is part of the anticapture switch which exists only in MOD 2 and MOD 3 torpedoes, and not in MOD 0 and MOD 1 versions. at pre-enable.) 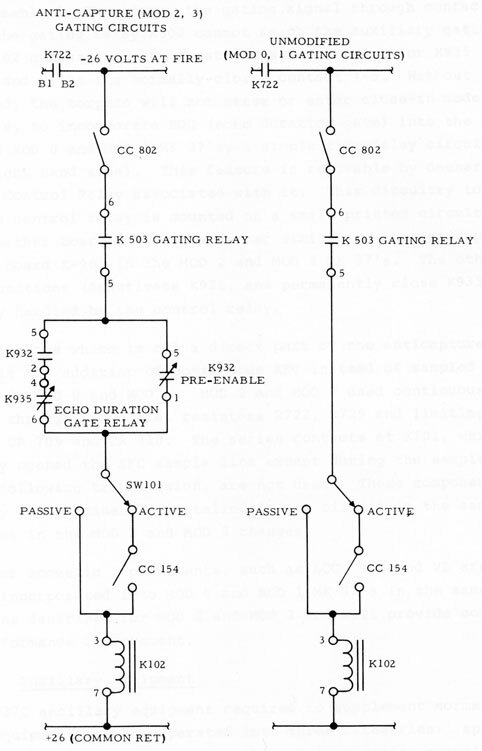 Therefore, the gating signal through contacts 5-6 of the gating relay K502 cannot reach the auxiliary gating relay K102 unless the echo duration is long enough for K935 to release and close its normally-closed contact 4-6. Without K102 energized, the torpedo will not steer or enter close-in modes. Therefore, to incorporate EDG (echo duration gate) into the unmodified MOD 0 and MOD 1 MK 37's, a simple time delay circuit is used (right hand side). This feature is removable by deenergizing the AIP Control Relay associated with it. This circuitry together with its control relay is mounted on a small printed circuit board on the mother board E-800 in a manner similar to the anticapture circuit board E-900 in the MOD 2 and MOD 3 MK 37's. The other relay functions (deactivate K931, and permanently close K933) are directly handled by the control relay. Another change which is not a direct part of the anticapture change is the addition of continuous AFC instead of sampled AFC as used in MOD 0 and MOD 1. MOD 2 and MOD 3 used continuous AFC control through two series resistors R722, R729 and limiting Zeners, CR 709 and CR 710. The series contacts at K701, which formerly opened the AFC sample line except during the sample period following transmission, are not used. These components are directly and permanently installed in the circuit in the same manner as in the MOD 2 and MOD 3 changes. The other acoustic improvements, such as ACC, TVG and VL are directly incorporated into MOD 0 and MOD 1 MK 37's in the same manner as described for MOD 2 and MOD 3 and will provide comparable performance improvement. items, all considered necessary to support the MK 37C torpedo, are provided by Northrop as a portion of the complete MK 37 conversion kit. 2.3.2.1 Spares and Expendables. Spare parts are the same as those for standard MK 37 MOD 2 or MOD 3 except for MK 37C kit parts. Engine spare parts are essentially the same as those used for the MK 46-1 engine. Except for the warshot battery, nitrogen cartridge, and water probe fitting, all expendables are engine and accessories bulkhead items. 2.3.2.2 Workshop Equipment. The workshop equipment required to service the MK 37C torpedo primarily consists of existing MK 37 shop equipment. Other equipment required consists of several adapters to existing MK 37 shop equipment, standard MK 46-1 engine servicing tools, and several wrenches and support fixtures peculiar to the MK 37C. A complete list of workshop equipment is included in Section 5.0. 2.3.2.3 Instruction Manuals. Existing MK 37 operation and procedure manuals are essentially applicable to the MK 37C. The propulsion and acoustic conversion kit description and instructions will be accomplished by inserting pages into existing MK 37 manuals. The revised manuals will include all necessary information required to service and maintain the MK 37 torpedo. The task of converting a MK 37 torpedo into an improved MK 37C torpedo is minimized by the availability of complete conversion instructions, required tools, technical services and conversion checkout equipment. All of these conversion aids have been designed for the installation of the MK 37C kit in almost any location having minimum torpedo shop facilities. Instructions - Each MK 37 conversion kit is accompanied by a complete instruction manual. The manual presents step-by-step instructions, including graphic aids, to guide the user through a detailed hardware removal and equipment installation procedure. Tools - Few special tools are required to effect the conversion of a MK 37 torpedo to a MK 37C. Special tools required are those that are used to drill the MK 37 battery and fuel hulls for the installation of a seawater inlet fitting, and the removal of two bosses located on the aft bulkhead of the former battery section. These modifications could be performed by ordinary machine shop equipment; however, the special tools are self-locating on the hull section joint band and greatly simplify the drilling operation. Technical Services - Northrop Corporation technical representatives will be available to provide instructions and technical support for the MK 37C kit installation. This technical support level may be proportioned for any number of torpedoes to be converted. Checkout Equipment - FIR modules which have been modified by the acoustic improvements will be tested by the FIR test section of the Northrop Acoustic System Tester. The existing MK 349 Test Set and the Northrop Acoustic System Tester will also be used to perform system go/no-go checks. The results of analysis, laboratory and in-water tests relating to performance improvements of the MK 37C over the standard MK 37 performance parameters are enumerated in this section. The changes in the acoustic and guidance and control subsystems to effect the improved performance are discussed in detail. Basically, three types of data were accumulated on the MK 37C system - operational, mission, and subsystem. Operational data and experience were obtained by preparing, handling, and loading the MK 37C onboard both a submarine and range launch ships for various in-water tests. Mission data were taken during in-water runs against acoustic and real submarine targets. Subsystems data were accumulated on the basis of both laboratory and in-water test results. The following methods were used to evaluate the MK 37C system performance; in-water tests, analog computer simulation, laboratory tests, and engineering analysis. The in-water test results are discussed in paragraph 3.2. A six-degree-of-freedom analog computer dynamic simulation was used to investigate effects of increased speed on control gain settings and to study torpedo launch under various ballast and trim conditions. Laboratory tests were conducted on the engine and fuel tank subsystems. Various engineering analyses were performed regarding structures, stresses, weights, the guidance and control system, and major electronic circuits. The results of these efforts were confirmed by successful in-water tests. Starting in 1968, six separate in-water test programs were conducted on the MK 37C torpedo. The major areas of investigation for the six programs were operational, acoustic, and propulsion performance. Also, many other aspects of the weapon design were verified. A schedule for the six test programs is given in Figure 3-1 and the results of the tests are summarized below. The test programs provided an opportunity to demonstrate performance and, also, the field experience led to a simple conversion design. The Northrop Corporation concept of replacing the electrical propulsion system of the MK 37 torpedo by thermochemical propulsion similar to the MK 46-1 was initiated in March 1968. The laboratory or bench tests on the conversion began in July 1968 at the Quality Evaluation Laboratory, U.S. Naval Torpedo Station, Keyport, Washington. The instrumentation at this facility was employed on the first runs to assure accuracy in obtaining data for comparison with the normal MK 46-1 torpedo propulsion system. vehicle with increased speed and no degradation to the normal MK 37 acoustic system. The conversion also provided fuel capacity for a range more than 60% greater than that of the electric MK 37 at maximum speed. The stability of the vehicle was retained by adjusting the guidance and control gain settings consistent with the increased vehicle speed. 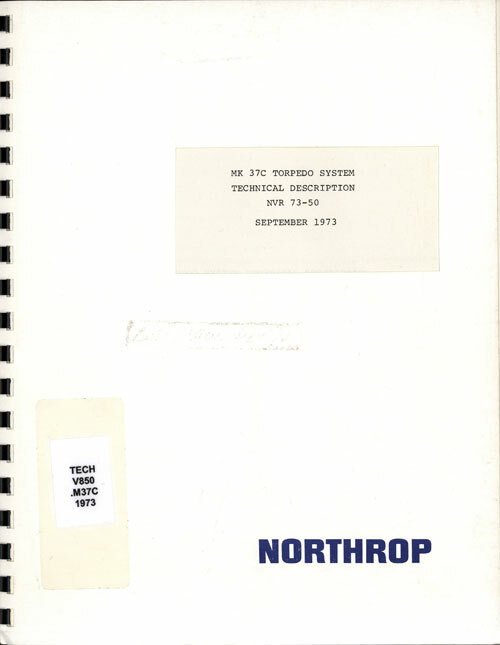 A complete test report (NVR 6391) was published in January 1969. • Determine if the existing system was operating to its design specification. • Determine if changes could be incorporated to improve its performance. • Determine if these changes were compatible with the new thermochemical propulsion system. The Keyport Acoustic Improvement Program (AIP) produced a significant performance increase in the acoustic Active homing mode. in-water tests against new submarines and submarines with low bow and stern aspects indicated more than double the normal acoustic detection ranges and probability of detection. These first tests were conducted with a conventionally propelled MK 37-2 torpedo. The results of the Acoustic Improvement Program proved that the MK 37 acoustic system could achieve good detection ranges on targets with small silhouettes. The Naval Torpedo Station then planned tests to determine if these same acoustic changes were compatible with the MK 37C engine conversion. 1. The acoustic and propulsion changes were compatible after six rubber isolation mounts supporting the acoustic panel were installed. 2. Shallow depth performance was established. The engine operated at depths of 10 feet. The acoustic system operating data to depths of 10 feet were taken. 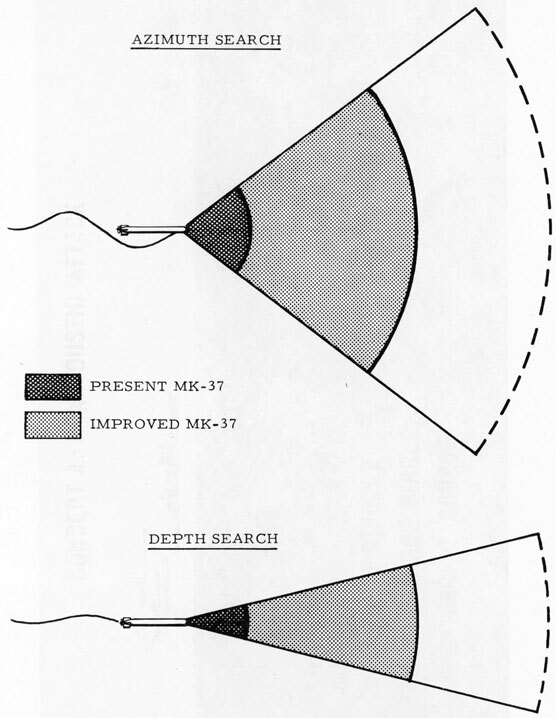 Increased speed required raising the threshold at very shallow depths in the same manner as the existing MK 37. 1. 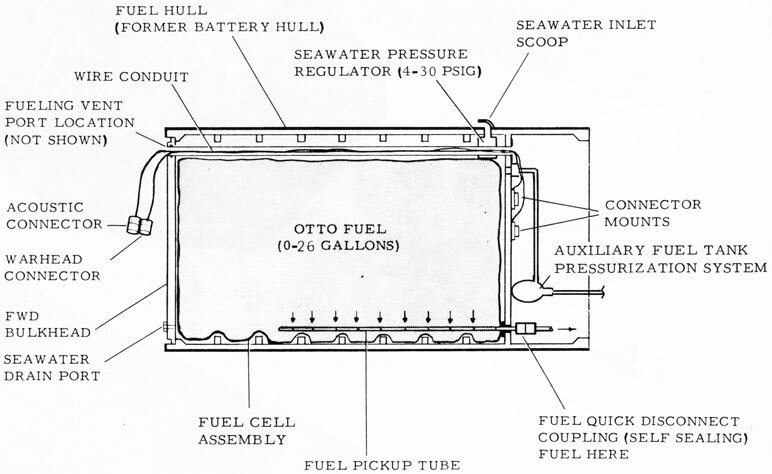 A simplified fuel tank system was devised. 2. A reliable start sequence for shallow depth was devised. 1. Preliminary review of Northrop Ventura MK 37 torpedo proposal with Keyport modifications suggests that although trial results to date are encouraging and show promise, certain areas require more data, such as attack, re-attack, and in-water noise under operational conditions. 2. To obtain more data, arrangements can be made with HMCS Rainbow (EX Argonaut) to fire two Northrop torpedoes on Nanoose Range in the new year (maximum four firings) if Northrop so desires." This offer presented the opportunity to verify system operational aspects of the conversion firings from an operating submarine. The offer was accepted, and tests were conducted on 25 and 28 January 1971, at Nanoose Range. These tests were conducted by firing the MK 37C and a standard MK 37-0 under identical conditions to obtain comparative data. Test results confirmed earlier data that show a speed increase of over 40%, a high-speed range increase capability of over 60%, and improved acoustic detection against a small target. The tests provided the first opportunity to launch the conversion from a submarine. System compatibility was demonstrated and no interface problems were encountered. A MK 37C production design was completed in late 1971, with two sets of initial production hardware produced in early 1972. The two kits were an excellent representation of final production hardware, including machined castings and printed circuit boards. The two kits were installed in two Canadian MK 37 torpedoes, one MOD 2 and the other a MOD 3 configuration. Detailed documentation, including photographs and records, was maintained during initial conversion of the two torpedoes, and engineering corrections were initiated as required. The two initial modifications were completed in April 1972 and transported to Naval Torpedo Station, Keyport, Washington, in May 1972. Initial in-water testing commenced on 19 June 1972. • Twenty runs for general evaluation of preproduction hardware, and for engine torque vs propeller configuration evaluation. • Two runs to demonstrate high-speed long-range capabilities of the MK 37C. To obtain general functional performance verification of MK 37C kits prior to productionization. • To select propeller blade size to optimize torque and shaft speed for selected shaft horsepower/speed. • To demonstrate capability to run approximately 20,000 yards range at the new higher speed. • To further demonstrate Active mode acoustic performance equal to that obtained during the HMCS Rainbow tests. 3.2.5.1 Results. The MK 37C was launched 20 times at the Dabob Test Range at Keyport, Washington and two times at the Nanoose Underwater Weapons Range in Canada for a total of twenty-two (22) launches. The twenty (20) launches performed at Dabob Bay were primarily torque vs propeller configuration evaluation and general hardware performance tests. Acoustic tests were also performed during the last fourteen (14) Dabob tests. The Nanoose Range tests were designed to demonstrate maximum performance of the Northrop MK 37C torpedo. • Tailcone ballast increased to improve torpedo weight and balance condition. • Fuel tank manually prepressurized to accommodate 4 foot deep launch tube of range surface launch vessel. • Excellent hardware performance throughout all runs, including flawless engine performance. • Successful active attack on small size target 7 of 11 attempts (including divergent launches) with an average acquisition distance of 63% maximum MK 37 acquisition capability. MK 37 high speed range against a small active target. • 240% maximum MK 37 high speed range at a velocity of 1.42% maximum MK 37 high speed demonstrated. Following the completion of the preproduction verification test program, the resultant hardware changes were incorporated into the production design and new updated production hardware installed in the two Canadian demonstration torpedoes. Included in the hardware changes were a production version of the seawater detector circuit, a redesigned tailcone ballast casting, and a new automatic fuel prepressurization system utilizing an electrically initiated nitrogen cartridge. In-water tests with the production hardware were initiated in December 1972. • Three hardware evaluation runs. • Four shallow water self-noise and propulsion system runs. • Two runs against a shallow large passive target. • Four maximum performance demonstration runs against a deep active target. • To verify new design hardware performance. • To determine shallow passive self-noise characteristics to be utilized in the readjustment of MK 37C shallow passive sensitivity. • To determine the effectiveness of the MK 37C, with readjusted shallow passive sensitivity, against a large target located at 10-foot depth. • To demonstrate the speed, endurance, and improved acoustic performance capabilities of the MK 37C torpedo. runs, respectively, prior to the engine casualty occurrence and were refurbished, used, engines prior to initial installation into the two torpedoes. • MK 37C shallow self-noise data, as recorded, were successfully correlated with previous MK 37C Keyport data. • MK 37C acoustic panel shallow sensitivity decreased to level below self-noise levels as indicated by data. • Two excellent passive target attacks and subsequent reattacks on target at depth of 10 feet. • Excellent demonstration of stable torpedo dynamics and propulsion system performance at constant 12-foot running depth while doing a snake search. • Demonstrated maximum MK 37C high-speed, distance and acoustic capability with over 1.42% normal MK 37 speed, over 200% normal MK 37 high-speed distance, active acoustic acquisition on small deep target at 60% maximum range followed by additional target reattacks. The performance of the various subsystems is discussed in this subsection. Both in-water and analytic data are used to provide information on the operating characteristics of the subsystems. a solenoid valve, new propellers, and new fuel tank arrangement. The new valves provide control of the coolant and fuel systems. The MK 37C propulsion system has undergone extensive testing, both in the laboratory and in water. A total of 13 special laboratory runs were conducted at the engine vendor's (Gould, Incorporated) test facility, and 71 in-water runs were conducted at the Dabob Bay and Nanoose test ranges, in developing and demonstrating the propulsion system. Engine operation is initiated by an igniter which is operated by the torpedo's auxiliary power battery. As a safety measure, a water detector, located in the tailcone water inlet, prevents engine ignition prior to submerging the torpedo in water. The igniter sets off a small propellant grain which pressurizes the combustion chamber system, starting the engine, and operating the fuel interlock valve. The fuel pump, seawater pump, and actuator drive are all geared to the engine. The seawater pump supplies cooling water to the combustion chamber and engine. The fuel pump supplies fuel to the engine from the fuel tank. The engine converts thermal energy of hot gases to rotary mechanical force, consisting of two counterrotating elements to which the propeller shafts are attached. The engine system is covered in detail in paragraph 2.3.1.1.1. During in-water tests, the propulsion system of the MK 37 operated in a similar manner to a standard MK 46-1 system. Engine crossover time, the transition from starter grain energy to fuel burn energy, was typically 0.8 second. Fuel consumption rates were about 1.4 gpm and shaft horsepower generated was slightly above the normal MK 46-1 shaft horsepower. Post-test engine inspection indicated that all engine components were in satisfactory condition and comparable to post-test engine parts from a normal MK 46-1 torpedo system. Data from propulsion tests and in-water tests compared favorably with predicted propulsion shaft horsepower, and measured values. Typical engine and fuel system performance parameters for in-water runs are given in Figure 3-2. These values were obtained during the first series of propulsion tests at the Naval Torpedo Station, and during the final production verification tests. Relative speed is listed based on standard MK 37-2 high-speed. The engine test program conducted with Gould, Incorporated, has upgraded the reliability of the MK 46 MOD 1 engine in its MK 37C application. A rubberized nylon fuel cell provides an Otto fuel capacity of 26 gallons, which is more than sufficient to meet the increased range capability. All 18-minute runs have been completed with residual fuel remaining in the fuel cell. The MK 37C acoustic improvement is provided as a selectable feature, permitting the operator to choose the acoustic system as it now exists, or by switching to anticapture switch position 1. The operator may select the MK 37C acoustic improvement provision. As previously discussed, the MK 37C acoustic improvement affects only the active acoustic mode. The passive mode is basically unchanged except for a decrease in shallow passive acoustic sensitivity required to accommodate increased vehicle speed. Further, as Figure 3-3 indicates, the MK 37C acoustic improvement provides the greatest value for low silhouette targets. For large targets, the present active acoustic mode or the MK 37C acoustic improvement mode may be used. MK 37 homing performance was obtained. These data were collected during both the first and second test programs as well as the production verification tests. During the Naval Torpedo Station acoustic and propulsion test series, eight runs were conducted in the passive mode to determine shallow passive performance. During the runs the MK 37C was programmed to home in on a shallow target from various ranges. Test results indicated that the MK 37C can attack a shallow or surface target with comparable reliability of the conventional MK 37. Acoustic panel sensitivity, false alarm protection, noise isolation, and transmit frequency adjustment are discussed in the following sections. Since the acoustic subsystem is not changed in the passive mode, excepting shallow passive sensitivity, only those aspects that relate to the active mode are discussed. 3.3.2.1 Acoustic Panel Sensitivity. As discussed in Section 2.0, the acoustic panel sensitivity was increased in order to improve the probability of detecting low return targets in the active mode. This section gives the results of analysis of MK 37 acoustic performance related to panel sensitivity. Calculated acoustic performance is shown in Figure 3-3. Acoustic echo signal levels were calculated at the transducer. 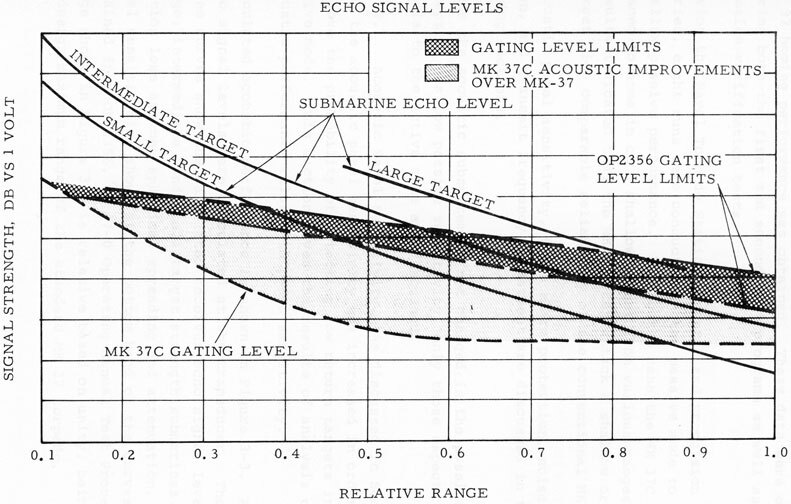 The upper three curves show the calculated receiver echo signal levels from large, intermediate, and small target strength submarines. Propagation loss assumes spherical spreading and attenuation. The panel sensitivities shown at the bottom band of the curves were obtained from OP 2356, MK 37-0 Operating Manual Test Procedures. Range shown in Figure 3-3 is relative based on unity, being equal to design maximum range of the standard MK 37 torpedo. The curves show that for the standard MK 37 there is margin for detection of a large target strength submarine out to a range of .8 of the original MK 37 design specifications. However, for small targets the curves indicate that detection capability of the standard acoustic system is substantially reduced. 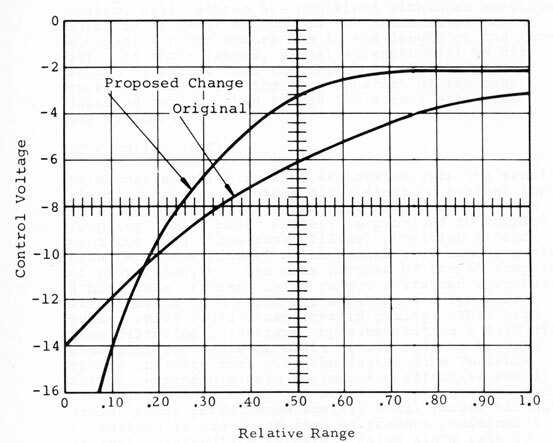 The lower dashed curve shows the improved sensitivity obtained with the MK 37C acoustic changes introduced. To obtain the panel sensitivity increase indicated by the lower dashed curve, the Time Variable Gain (TVG) decay rate is increased by a time constant change. This change is incorporated in the system by reducing the TVG discharge resistor (R426) from 560K to 220K ohms. The TVB control voltage before and after the resistor change is given in Figure 3-4. Acoustic signals, as received by an active sonar transducer, are subject to a wide dynamic range during each ping cycle. No practical linear amplifier can accommodate this range successfully. As a result, an Automatic Gain Control (AGC) system must be used. An ideal Automatic Gain Control system could hold the average output level to a constant value over the expected dynamic range. The MK 37 AGC system is supplemented by an "a priori" knowledge of the incidence of the transmit pulse and its ensuing high reverberation level. This circuit is the Timed Variable Gain (TVG) circuit whose decay rate is adjusted to cause the average reverberation level to remain constant throughout the cycle. 3.3.2.2 False Alarm Protection. A simple sensitivity increase can subject the torpedo to more likelihood of false alarm due to surface, bottom or other boundary echoes; therefore, some complementary steps are provided to counter the possible adverse effects of increased sensitivity. The following three false alarm changes are added as acoustic improvements; Permanent Echo Duration Gate (PEDG), AC Coupling (ACC) and Vertical Steering Latch (VL). These changes are discussed as follows. This change, which is also associated with the sensitivity increase, provides discrimination against long duration pulses as expected from reverberation. AC coupling ("high pass" filter) is provided to complement the PEDG ("low pass" filter) providing a band-pass "envelope filter" which passes only echo signals of proper length. The main purpose of the AC coupling ("high pass" filter) is to reject sustained reverberation levels upon which are superimposed spurious pulses which could cause invalid gating. This high pass filtering is achieved by substituting a 0.15 mfd capacitor for resistor R521. Tests made on Keyport ranges indicate that with the faster Time Variable Action, expendable gain to increase effective sensitivity, and the fixed PEDG and AC coupling, the acquisition range performance against small target strength submarines is nearly as good as present performance against intermediate targets. False alarm rate remains comparable to that before the sensitivity increase was made. the surface. Lock-in contacts are provided on the steering relays (K501), and Resistor R515 serves to partially lock these relays into closed position once a steering order is received. Tests indicated that a smaller value of resistor (27K to 15K) would lock in the relay for the balance of the ping cycle. This lock-in function prevents reverse steering due to reflected echo arrival from the surface. 3.3.2.3 Noise Isolation. The MK 37 with its electric drive is a relatively quiet torpedo. Adding the thermochemical engine and running at higher speeds has increased low frequency torpedo noise by about 15 dB. However, in-water tests do not show any significant acoustic homing performance deterioration due to this noise. The MK 46-1 propulsion system utilizes acetal plastic bushings and washers to isolate the accessories bulkhead assembly from the hull structure and reduce engine noise transmitted to the hull assembly. The MK 37 conversion vehicle utilizes the same isolation bushings and washers with additional hull interface isolation mounts added to further reduce propulsion system noise transmitted to the tailcone hull structure. The only other direct sound transmission paths from the accessories bulkhead to the hull is the seawater inlet tube and fuel line. Both of these line assemblies are constructed of nylon reinforced elastomer materials to increase resistance to direct sound transmission. Initial tests on acoustic improvement and propulsion compatibility revealed that there was some microphonic noise generated in the panel. The panel was shock-mounted by the installation of six (6) mounts utilizing existing mounting holes. This improvement in sound isolation makes the propulsion and acoustic improvements compatible. 3.3.2.4 Transmit Frequency Adjustment. The speed increase associated with the thermal propulsion requires minor revisions in the Acoustic Panel to ensure compatibility. The MK 37 transmit oscillator frequency normally is offset downward to correct for doppler shift due to own speed. Therefore, at rated speed, reverberation will be received at a nominal value of the torpedo transmit frequency. Slight variations from this, due to minor speed changes or irregular boundary conditions, are accommodated by the AFC system in the receiver doppler channel. The transmitter tuning network, Z201, contains two tuning capacitors, which were used for the original MK 37 high speed setting. An external capacitor is now added for the higher speed MK 46 engine operation. 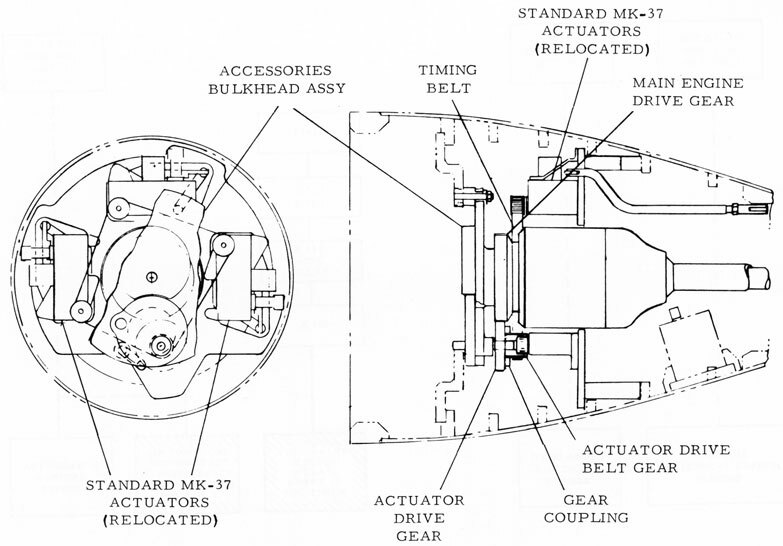 No physical changes are required in the guidance and control subsystem hardware to accommodate the MK 37 conversion; however, some minor gain adjustments are needed. These adjustments are made by use of existing variable potentiometers which are accessible on the guidance and control computer. The guidance and control subsystem consists of various control sensors that obtain information about the torpedo's motions, a control computer that compares commanded motion signals to actual signals and computes control surface correction signals, and the control actuators that move the control surfaces and reduce any error between commanded and actual torpedo motions. Increasing the speed of the MK 37 affects the guidance and control subsystem in that the control surface forces increase proportionally to the square of speed. The increase in control surface forces changes the torpedo's turning rate, roll compensation, controlled response forms, load carrying capability, and launch transient. These topics, along with the required system adjustments, are discussed briefly under subsections 3.3.3.1 and 3.3.3.2. 3.3.3.1 Torpedo Control. Analog computer simulation and in-water test results were used to evaluate the effect of speed change on MK 37 guidance and control performance. Control gains for the MK 37C are adjusted only slightly differently from those used for the standard MK 37. In-water tests were used to obtain a set of gains. These documented values are set during normal deck check of the MK 37C prior to an in-water run. The increased speed of the MX 37C has an effect on the following control parameters -- turning rate, roll compensation, control response, and splay angle. A discussion of the influence of speed on these parameters is given below. Circle search, and acoustic azimuth steering are influenced by the increased speed of the MK 37 conversion. where V is the speed, R is the turn radius, and ψ is the turn rate. Since the MK 37 conversion speed has increased, either the turn radius or turn rate or both are increased. speed is increased results in a larger turning radius for the MK 37 conversion torpedo. The acoustic azimuth steering is altered slightly since the steering sensitivity is common to both this mode and circle search. An open loop bias signal proportional to course rate is used in the roll control computer to generate differential elevator angles to compensate for roll in steady turns. A roll moment is imposed on the torpedo in a steady turn due to the center of gravity being offset vertically below the center of buoyancy. This moment is proportional to the speed of the torpedo and its turning rate. The roll moment also is altered by torpedo ballast conditions. The roll bias gain was adjusted to compensate for the effects of increased speed and slight alteration in ballast. If the control gains are held fixed and the torpedo speed is increased, the dynamic response of the torpedo changes. Both the torpedo speed of response and the effective rate feedback signals are increased. A six-degree-of-freedom analog computer simulation of the MK 37 dynamics and control equipment was used to investigate dynamic response form changes due to increased speed. Computer results showed only a minor change in response forms. Gain changes were made to restore computer response forms to those obtained at lower speed. In-water tests were conducted using standard MK 37 gains and the new set of gains resulting from computer simulation. There was insignificant difference in the test results using the two different gain sets. On the basis of these results, the standard MK 37 gains were used with only the previously mentioned slight adjustments made for tuning rate and roll compensation requirements. Because of a slight difference in torques produced by the fore and aft propellers, the MK 37 conversion torpedo is subject to a steady roll moment. To prevent this roll moment from causing a steady roll angle, a differential elevator angle is used. This small splay angle (3 to 4 degrees) is obtained by adjusting the fin mechanical linkage and electrical hold-in adjustment. 3.3.3.2 Weight and Balance. The weight and balance of a standard MK 37 exercise torpedo remains unchanged when the MK 37C propulsion and acoustic modifications are incorporated. The conversion includes a 22-pound reduction in the exercise nose weight. The weight and balance of the MK 37 MOD 2 and MOD 3 warshot torpedoes remain unchanged, except as shown in Table 3-1, when the MK 37C propulsion and acoustic modifications are incorporated. The gross weight of both exercise and warshot MK 37C torpedoes may increase an additional +24 pounds maximum when submerged in a flooded tube due to seawater taken into the fuel tank. The amount of increase is dependent upon the launch depth. After the torpedo is launched, a reduction in fuel section weight occurs at the rate of approximately 3.0 pounds per minute of torpedo run. The reduction is caused by the displacement of fuel by less dense seawater within the fuel section. b. Launch transient during slow speed swimout. heavy and the center of gravity and buoyancy being separated by -1 to +12 inches. Swimout tube exit speeds were as low as 3 knots. Ballast conditions caused no significant problems when the torpedo was at cruise speed. 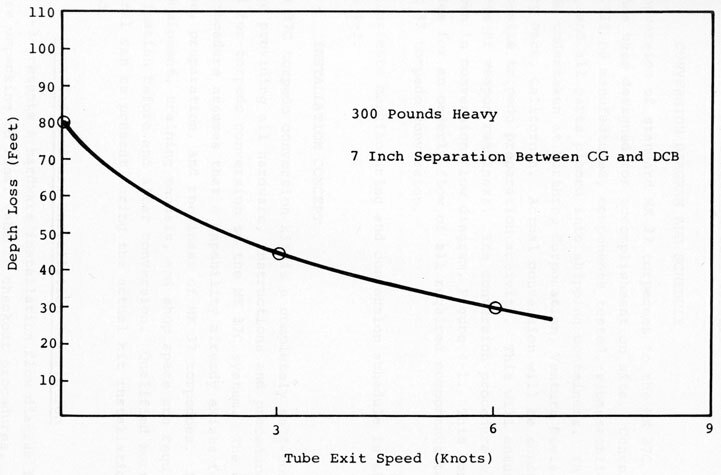 For normal tube exit speeds, no adverse transient motions were obtained. To further investigate the launch transient, an artificially low torpedo exit speed of 3 knots was used. Even for this condition, the torpedo recovered from an initial depth loss transient during the period that the propulsion system was bringing the torpedo up to cruise speed. Typical computer results for the low speed launch are shown in Figure 3-5. Depth loss is plotted as a function of separation distance between the center of gravity and buoyancy for ballast conditions from -200 to -300 pounds heavy. The tube exit speed was 3 knots. Initial depth loss is strongly dependent on tube exit speed. Figure 3-6 shows this relationship. For typical tube exit speed conditions, expected to be not less than 9 knots, no adverse launch transients are anticipated. Power for the control system, acoustic system, exercise instrumentation, warhead activation, and start circuitry is supplied by a single battery package. Depending upon the torpedo mission, one of two battery packages is selected. A squib activated primary battery is used for warshots while a secondary battery is used for exercise. The battery packages are interchangeable in the torpedo. The battery packages are designed to provide 26 volts and 36 amps steady current for 20 minutes. Power to activate the primary battery is obtained from the 115 volt, 60 cycle circuit of the fire control system which is used to activate the warshot battery of the standard MK 37.
as shown in conversion flow diagram, Figure 4-1. This concept provides for an orderly flow of all required components to effect the MK 37 torpedo conversion. An approximate manufacturing and conversion schedule is shown in Figure 4-2. The MK 37C torpedo conversion kit is a completely self-contained package providing all hardware, instructions and procedures required for torpedo conversion to the MK 37C system. The conversion procedure assumes that a capability already exists for maintenance, preparation, and readiness of MK 37 torpedoes. Personnel, test equipment, training manuals, and shop space are required for certification before and after conversion. Qualified Northrop personnel can be present during the actual kit installation, if so desired. Figure 4-3 presents a hardware installation flow diagram from hardware unpacking to final vehicle checkout procedures. The first step of the conversion procedure is the receipt and unpacking of the kit components, special tools and instructions. Following receipt of the hardware, kit installation instructions must be thoroughly reviewed. Northrop Corporation representatives can be available to assist with this process. The installation instructions will be available prior to receipt of conversion hardware, if desired. The next step in the conversion process is the preparation of the torpedo hull for conversion kit installation. All hardware must be removed from the battery and tailcone hull assemblies and seawater entry holes drilled in each section. Special drill fixtures are provided in the kit to facilitate this operation. The next procedure in the conversion process is the installation of kit hardware. This hardware primarily consists of subassemblies with some loose parts. A complete assembly, subassembly, and component parts list are included in the assembly instructions. All components are clearly identified as assemblies, subassemblies or individual components. Each kit installation is completely defined by a complete system description starting with the identification of the kit assembly item in the vehicle and then broken down to detailed component description. 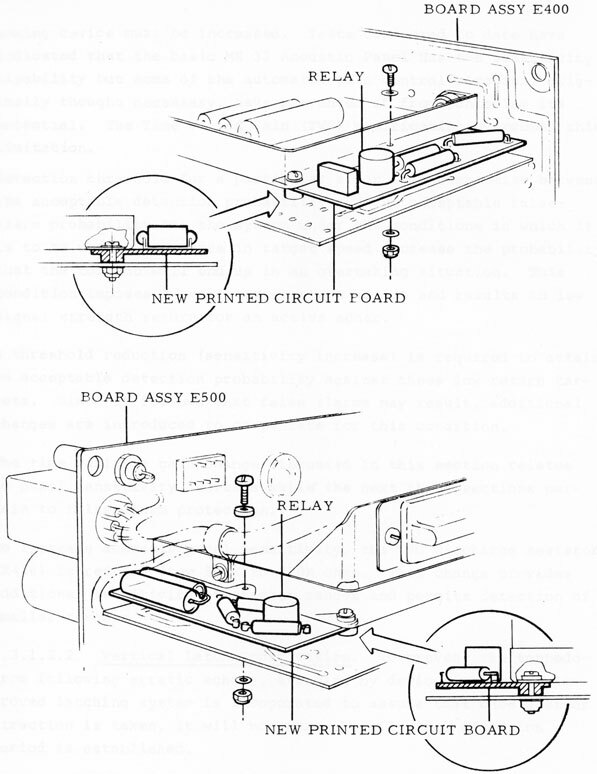 An example of the instructions for installation of acoustic panel circuit board E500A is shown in Figure 4-4 through 4-6. 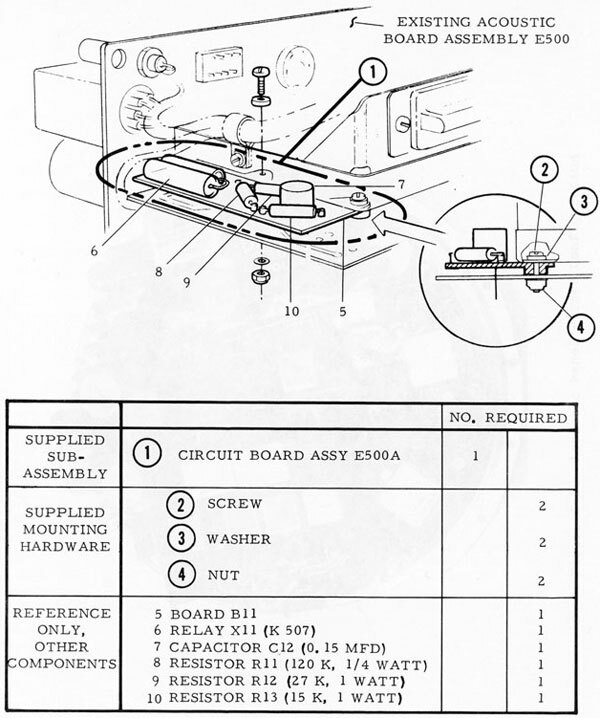 The location of the standard acoustic panel is shown in Figure 4-4; the acoustic panel assembly and the location of kit modification items, including board E500A, is shown in Figure 4-5; the figure shows the detailed installation and location of board assembly E500A. Although E500A is supplied as a subassembly, Figure 4-5 references the individual components. Figure 4-6 presents a photograph of a completed installation of board E500A and other acoustic panel subassemblies. The post-assembly checkout procedure provides detailed procedures for verification of the acoustic panel. Following kit installation and component testing, the torpedo is reassembled for systems and deck checking for final qualification as an operational system. Northrop personnel already familiar with the step-by-step detail required to effect the conversion can initiate the effort in close cooperation with Customer-assigned conversion technicians. Requirements for conversion are contained in the instructions accompanying each conversion kit. Complete graphic instructions are provided covering each phase of the conversion task. Maintenance and preparation of the MK 37C will be in accordance with the MK 37 Handbook as modified by inserts for the propulsion and acoustic system changes. a. The acoustic modules, with the acoustic improvement kit installed, are tested individually in the FIR (Functional Item Replacement) test section of the Northrop Acoustic System Tester. The Acoustic Panel, with the acoustic improvement packages installed, may be tested as a unit in the standard FIR shop tester. With the acoustic improvement control relays deenergized, the panel and FIR modules should pass all test requirements of corresponding Acoustic Panel MODS. b. The Fuel Section Assembly, after completion, is leak checked for not less than 15 minutes. Pressure shall not drop below specified minimum pressure within this period. c. All fuel and water lines are pressure or vacuum checked. Leaks are located by soap-in-water bubble checks or pressure/vacuum losses. d. The actuator system is checked for proper belt action and freedom. e. After kit installation, the vehicle is subjected to normal MK 37 systems and deck checks using the MK 281 Test Set; the control gains are adjusted and the fuel solenoid igniter circuits are tested. The acoustic system is tested with the MK 349 Test Set in the conventional acoustic mode and with the Northrop Acoustic Tester in the acoustic improvement mode. Following successful completion of the deck check, the Fuel Section Assembly is fueled using vacuum fueling procedures. A battery is attached to the aft bulkhead and interconnecting fuel lines secured. The entire vehicle is then assembled and vacuum checked in the same manner as a standard MK 37. The unit is now ready to be placed in service. A detailed check list is utilized in final torpedo assembly and test preparation. Maintenance techniques applicable to the extensively used MK 46-1 engine apply directly to its use in the MK 37C. Engine system maintenance remains unchanged from standard MK 46 procedures. Valving and piping differ slightly in detail, but settings and run maintenance cycles are similar. The standard maintenance procedures applicable to the unmodified MK 37 apply directly to the MK 37C except for the propulsion battery and tailcone sections. post-run servicing. A battery is used to provide either of two types of auxiliary power: secondary for exercise, or squib activated for warshot. The former requires normal silver-zinc battery maintenance procedures which are common to MK 37 battery shops. The fuel tank, tailcone components (water unloading valve, solenoid valve, fuel line couplings) require flushing at the conclusion of an exercise series and before extended storage. The igniter fuse must be checked and replaced if required. Operational maintenance includes deck checking as a standard MK 37, battery charging/installation, and fueling. Existing support equipment, such as the MK 281 and 349 Test Sets with vacuum and pressure test sets, is directly applicable. All handling beyond the torpedo shop is identical to techniques used for the standard MK 37. Detailed, step-by-step instructions, with exploded views, etc., will be provided as a part of the propulsion and acoustic conversion kits. a. Battery section conversion instructions and data. b. Tailcone section conversion instructions and data. c. Acoustic panel modification instructions and data. The battery section, tailcone section and acoustic panel modifications may be accomplished as separate conversions. Remaining hull sections are unaffected by the conversion except for electrical hardware removal and fuel line installation. A detailed example of typical conversion instructions provided for a circuit board assembly is given in Section 4.0.
a. Fuel section (former battery section) physical description. b. Fuel section functional description and maintenance. d. Tail section physical description. e. Tail section functional description and maintenance. f. Acoustic panel physical description (maintenance remains unchanged). The MK 37C propulsion and acoustic conversion kit makes maximum use of the support equipment existing for the MK 46-1 engine and standard MK 37 torpedoes. Special conversion and workshop equipment for the modifications are kept to a minimum. To simplify the machining of the seawater entry holes in the fuel and tailcone hulls, the following tooling is required. The following special equipment will be supplied in addition to standard MK 46 and MK 37 workshop equipment. Equipment used herein is a part of the basic MK 37 and MK 46-1 engine torpedo workshop support equipment applicable to the MK 37C deck checking and servicing. 1 MK 281 Test Set including gas pressure system and readout gage to 1000 ft seawater depth, grove loader, connecting hoses with quick disconnect fittings, and standard shop plumbing accessories as required. 2 MK 349 Test Set with transducer and interface oil. 3 Rate Table with interfacing cables. 5 Control unit tilt table. 6 MK 37 rudder position indicator. 7 MK 37 elevator position indicator. 8 Pitch position level indicator. 9 Roll position level indicator. 10 MK 37 handling dollies (6, including nose and tailcone). 11* Tailcone drive stand with engine drive motor and enabler. 12 Torpedo-to-MK 281 test set B-cable. 13 Complete set of T-handle Allen wrenches up to 3/4" size. 14 Set of snap-ring pliers. 15 Vacuum pump capable of attaining 25.0 inches of Mercury. Hoses, hose clamps, and a catch reservoir (50-gallon drum) for receiving seawater from the fuel tank after a test run. The vacuum pump also provides a means of vacuuming the tailcone/engine installation to check for leaks, the tailcone assembly being the most likely area of leakage on the standard MK 37 torpedo. 16 Battery charging facilities; minimum capacity 40 VDC, 10 amperes. 17 Various component extension cable assemblies. *Minor wiring modification to drive motor. ITEM STD MK 46-1 PART NO.